Executive Chef Christopher Moreland of The Carlton, located at the new Holiday Inn. Dinner at the Holiday Inn? May not sound like much of a date night. Christopher Moreland, though, wants to remind us of this hotel chain’s importance to small communities and generations past. 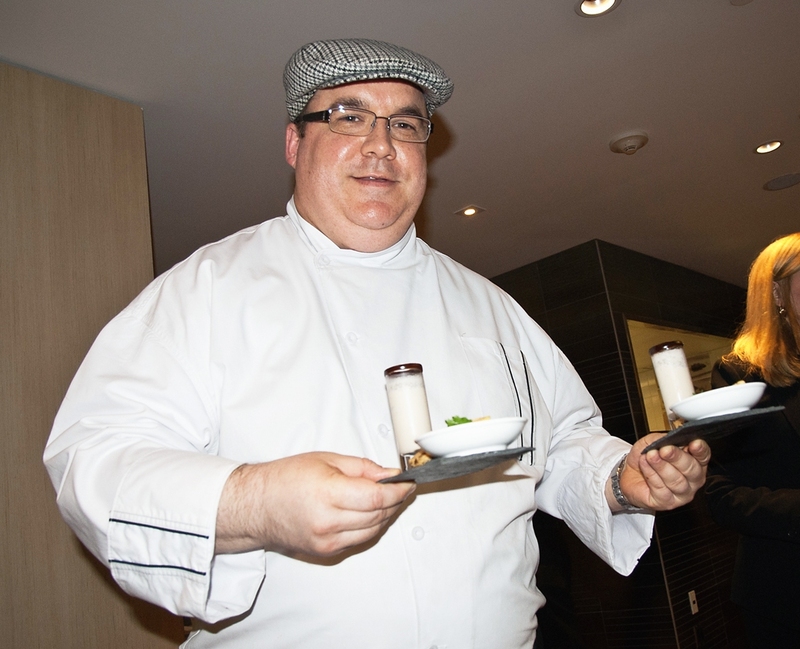 While presenting samples from the menu of The Carlton, the new restaurant operated by the recently opened Holiday Inn Downtown Centre, Moreland reminisced about his childhood and the excellent food his family would receive during visits to Chatham. He said the franchise hotel there was run by a German family and the food would be a draw for the city. “In these smaller communities, the Holiday Inn was the place you went to at night for a good-quality, fine-dining experience,” he said during the Grand Opening festivities at the 30 Carlton Street location on Wednesday night. From listening to Moreland, you understand he cares deeply about food. That passion will serve The Carlton well as it tries to establish itself as the go-to restaurant in an area of Toronto that could use more fine-dining options. With a distinguished resume, including stints at the Royal York and as director of restaurant operations at White Oaks in Niagara-on-the-Lake, Moreland has the expertise to plate some excellent dishes. His team also includes an executive sous chef who recently had a stage at Noma, the Copenhagen-restaurant voted best in the world by Restaurant Magazine last year. The food included a tasty fishcake made with sablefish instead of cod and a flavourful Australian lamb chop. For dessert, a vanilla bean milkshake with warm chocolate chip cookies ($9) was a winner. The wine list features several Ontario choices, including some terrific ones from Stratus Vineyards in Niagara. It’s hard to think of a restaurant attached to a giant global corporation as an underdog, but that’s what The Carlton is. It will be trying to lure dining dollars away from the financial district and Yorkville, and hoping it’s not held back by the Holiday Inn’s identity, which — despite the brand’s billion-dollar overhaul — still lacks wow. The food’s good and although it’s priced accordingly for the quality, it may be a little bit higher than diners might expect for the neighbourhood. The lowest-priced entrée is a Spaghettini with Mushroom Ragout for $18, but most of the choices are in the $20-range and the most expensive dish is a $35 Wellington County Beef Tenderloin. Worth a try, certainly for drinks and dessert after a movie at the Carlton Cinemas. Next Toronto food reviews for me: Signatures on Thursday night for a wine pairing. And Origin on Friday night. Eager to see how much of Colborne Lane’s excellence has made it over to Claudio Aprile’s new spot at King and Church. You’ve got great insights about food review blog, keep up the good work!